For the first time in history, the Philippines will have two clubs in the knockout stages of a continental competition. Kaya Football Club have officially entered the 2016 AFC Cup round of sixteen after they drew 0-0 away against Maldivian side New Radiant Sports Club in their final Group F fixture. Kaya had probably wanted a win, but they’ll no doubt be content with their advancement to the next round. The first half was a gritty affair between New Radiant and Kaya, as both clubs were intent on getting a win The away side had the first sniff on goal when forward Louis Clark headed the ball over inside the New Radiant box. That was Kaya’s only chance in the first half, as they struggled to create opportunities in open play or from set-pieces. Kaya had problems controlling the game, perhaps due to the absence of midfielders OJ Porteria and Alfred Osei. The match was patchy, as both teams conceded free kicks and gave away the ball cheaply at times. It was New Radiant, though, who should have scored when a player of theirs sneaked towards Kaya’s far post only for him to head wide. It was the home side that threatened to score before the break, but none of their attempts tested Kaya goalie Matthew Acton, and it was goalless at the break. Once the second half started, it was evident that both sides were reinvigorated after their respective half-time team talks. Kaya started the brighter of the two, and some good build-up plays allowed defender Shirmar Felongco two attempts at the New Radiant goal, both of which ended up failing to hit the target. Perhaps the biggest positive for Kaya in this game was their defensive solidity. 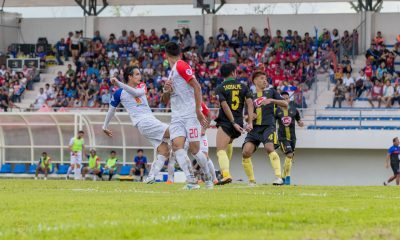 Acton barely had a save to make, as his backline, marshalled by veteran center-backs Masa Omura and Aly Borromeo, held the Maldivians at bay. New Radiant forwards Abdul Sadin and Hamza Mohamed saw their shots blocked and sail wide respectively as a result of their opponents’ strong defense. Deep in the second half, Kaya sought the solitary goal needed to win the match. A set-piece forced a scramble in New Radiant’s box and the ball rebounded to Clark outside the box, but he shot harmlessly away from goal. 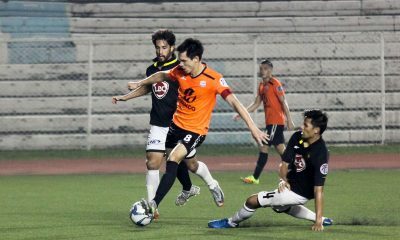 In the last few minutes of the match, forward Jovin Bedic latched on a long ball from Kaya’s backline, yet his attempt only hit the side-netting. The official signalled for four minutes of stoppage time. Kaya were making it a point to either keep the ball or allow New Radiant to hold it in non-dangerous areas. In the end, the game ended New Radiant 0-0 Kaya with both sides frustrated not to win. 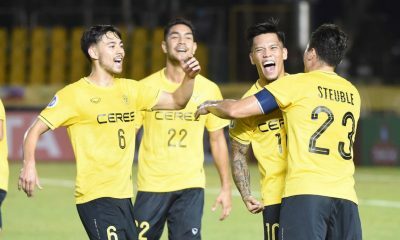 Nevertheless, the result allowed Kaya to join Ceres-La Salle FC in the knockout phase. 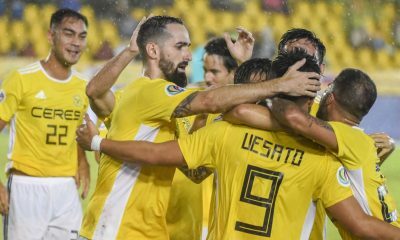 A draw was enough after Hong Kong-based club Kitchee Sports Club had trashed Singaporean team Balestier Khalsa 4-0 to ensure Kaya go through to the round of sixteen as Group F runners-up. Kitchee finish as group winners with 13 points, while Kaya are below them with 10 points. Balestier Khalsa and New Radiant had 7 and 3 points respectively. Kaya’s reward for advancing is a date away to Malaysian side and reigning champions Johor Darul Ta’zim F.C. on May 25, 2016. Please note that the round of sixteen is only a single-game affair. Two-legged ties will occur starting the quarter-finals.